Knowing how to style yourself well doesn't happen overnight. There are questions of taste, occasion, personality – the list is long. One styling choice that we aren't faced with everyday is how to buy and wear a statement piece. It's just not something most of us think about as we're dressing for work or heading out to dinner. But there's a little secret about statement pieces that anyone who's ever worn one will tell you – they are insanely fun to wear. Not only will people notice (and complement), but you'll also feel like a million bucks all day. There's hardly anything more indulgent you can do for yourself than making an impressive style statement. So where should you start with selecting and styling one? Price, designer...or something else entirely? This is rule number one when setting out to choose your next statement piece – don't go over the top. Overdoing it with too many colours, garish patterns or an overwrought concept is simply going to get a negative reaction. What you want to hear is wow, not whoa. So a good rule is to keep it to one outfit, one statement piece. If you're feeling confident then multiple statements could lift your game even further. And the piece that you do wear should add to and complement the outfit rather than induce shock (that's another topic altogether). Ideally, you'll wear an outfit that supports the statement and vice versa. After all, good style is about balancing your elements together. Whether it's your first time or one of many, deciding on your idea, how it’ll look and when and how to wear it will all be considerations before you whip out your bank card. There's nothing worse than seeing a statement piece fall flat. But there are a few things to watch out for to avoid that happening. After deciding which layer or piece within your outfit you'll make a statement out of, you should decide on which outfit you'll work it into. Then there's the cut – you might opt for tailoring, for example – and also the colour. Do you want it to pop or rather blend in? You might also use branding as a style compass if there a particular designer you're into. Lastly, set yourself a ballpark budget. It's really not that hard to overspend (and regret it) when shopping for a statement piece, especially if you've been pining for it. You shouldn't simply throw on a statement piece. Styling yourself well is about managing the balancing act between different, and sometimes competing, elements you have on. Getting the balance right involves an eye for detail, good taste and a thought-through approach to layering, colour matching and so on. But a statement piece changes the whole game plan considerably. Without being too obvious, the aim of wearing a statement is to make a statement. Whatever that statement actually is, you want one standout component in your outfit to grab everybody's attention. But what makes a piece of clothing or accessory stand out? To do that you should showcase the piece – whether that's through strong colours, a bold pattern or size and shape. Whatever it is, you need to go all in or not do it at all. 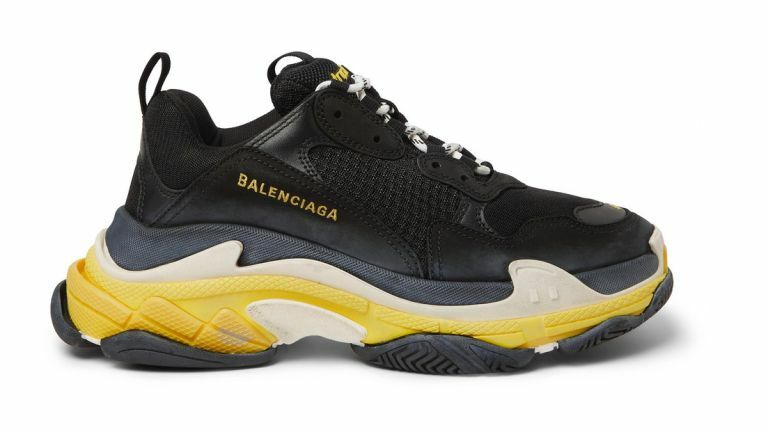 A regular pair of runners isn't going to catch much attention, but a pair that is rare or has been reworked by a notable designer is going to be an unusual sight. They might have an oversized midsole or be wrapped in velvet. Aiming for a really stand out item is one quick path towards styling a statement piece. You could even opt for a more minimal outfit that has few colours and little in the way of patterns or strong textures. Doing this sets you up for adding a statement jacket, vest or boots – the options are almost endless – and does it in a way that's clearly intentional while also being properly thought out. It's a balanced imbalance. Spring is not too far away and that means it's time to prepare for transitional layering season. This is the ideal time to start thinking not only about working on the interplay of spring colours and how you want to wear jackets and scarves, but also how you might work a statement in. So you might wear an Oxford shirt and jeans with a pair of box-fresh tennis shoes, then throw on a beanie in bright orange, or pinroll your jeans to show off a bold pair of red socks. Or if going for high contrast or colour blocking isn't your thing, then using the other colours in your outfit to support a statement blazer, such as with a darker-hued shirt or trousers, would boost the statement nicely while also keeping cohesion between every element. If you'd prefer a low-key statement that isn't trying to make everyone's eyes bulge, then adding a shiny watch or cufflinks into the mix is a great alternative. Going big on small details still sends a message about your style and brand affinity without always catching the attention of every person you pass. While it mightn't be seen from across the road, a classy wristwatch with shiny detailing can look standout. Sure, a nice watch doesn't come cheap, but this is something to prepare for if you're planning on making a statement. After all, you want your friends and colleagues to notice your styling choices and the thought process that's behind them. There are plenty of tricks to make your style pop or to be the centre of attention at an event. But at the end of the day, it's good to remember why you’re choosing a certain statement piece and what the statement is trying to achieve. After all, you don't be want to be the guy who's gagging for a compliment. Statement style should be about wearing your favourite pieces and celebrating the moment. A good approach is to stick to your personal style as a foundation. So rather than wearing blue suits every day and then suddenly walking into the office in a green three-piece, you could add a green statement vest with a neutral blue suit. To add some cohesion, perhaps the entire ensemble could share the same pattern to show that you're balancing each item, sticking to your personal style, all while adding some pop.